Wards are an essential part of Toronto's local government system and central to how Toronto's local government works. Voters in each ward elect one Councillor to deal with local and city-wide issues and represent their interests on City Council. Toronto has 44 wards, which vary in size, demographic composition and population. The average area for a ward is 15km2 and the average population is approximately 61,000. 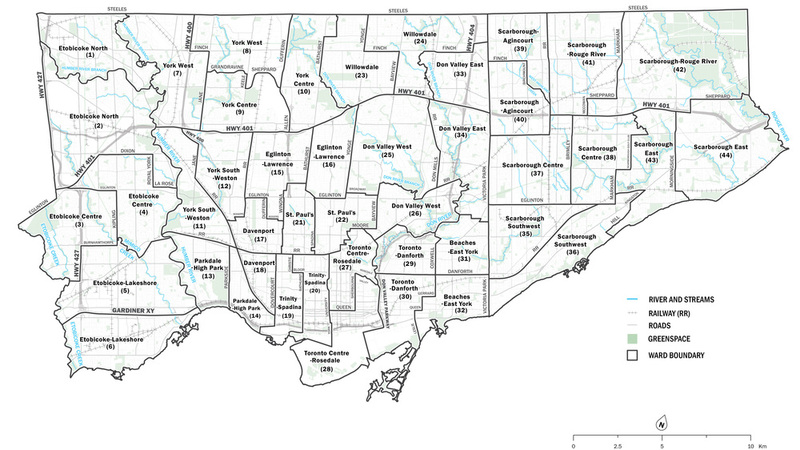 The current ward boundaries have been in place since 2000 when a new ward structure was devised based generally on the federal ridings (electoral districts) in Toronto. Each riding was split to create the current system of 44 wards. Ward Profiles have been developed by the City of Toronto for each of the 44 wards. They provide a portrait of the demographic, social and economic characteristics of the people and households in each City Ward. Don't know which ward you live in? Click here to look it up. In August 2015, the Toronto Ward Boundary Review released the Options Report. The report outlines 5 options for new ward boundaries in Toronto. All of the options meet the required criteria for a new ward boundary system. The Recommended Wards with Refinements (47 Wards) is an improvement to the TWBR Recommended Wards (47 Wards). In addition to achieving voter parity, it manages to keep many communities of interest together and has coherent ward boundaries. The Recommended Wards with Refinements (47 Wards) is the TWBR Team’s recommendation.